The key to the core of enterprise architecture, is understanding how different things (such as processes, data and information systems) relate to each other. Maintaining these relations and analysing them, is difficult - if not impossible, without an architecture tool. As such, the need for a tool arises quite soon, no matter how much we tell ourselves: "it's not about the tool"
It makes no sense to make tool selection into a science, and one should not use too much time doing it. Why? Because that time is away from actually doing architecture. You can find a lot of information about tools and tool criteria on the internet, as well as lists of requirements. each one more outrageous than the other. The key to a successful tool selection is to understand what kind of use the tool has in your organisation, and to understand what you have bought, once you have bought it. 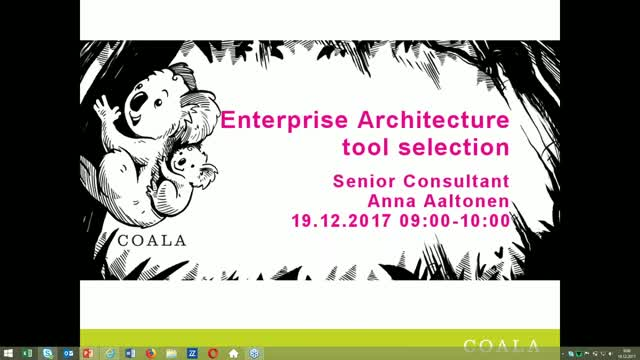 After this webinar you will have a grasp of what tool selection is actually about.